If you read yesterday’s post you’ll know a bit of history on the Trier Dom (also known as St. Peter’s Cathedral). Today, as I’m walking into this medieval structure I find it more beautiful and full of mystery than I could have expected. The first things I notice are the black imported marble accents - I’ve never seen anything like them. Next on the standout list is the organ – it sits high in the rafters and looks as if it’s floating. Elisabeth explains it is a swallow’s nest organ and she remarks on how stunning it is, as well. We round the day off with a hearty German meal and a new (to me) German beverage. I enjoy the worlds creamiest, most indulgent tomato soup with a freshly made, giant pretzel dunked in spicy mustard. The rest of the crew (clearly more German than I) enjoy potato salad and enormous beef roasts - flavored with caraway and complimented by sour cream and tomato sauce. I do join in on the cultural experience by ordering a Bananenwiezen..
My first view of Germany is that of the stunningly steep, cliff-side vineyards lining the Mosel River. Some 5,000 winemakers take advantage of the ideal sun exposure and intensified heat provided by the cliffs and the water’s reflection. These beautiful, unique vineyards characterize the Mosel region and boast world renowned grapes. The Riesling wines cultivated along the Mosel are rich in minerals and delicately fruity – they are unlike any other, the epitome of their kind. The grapes that thrive in this warm zone are late ripening and must be manually harvested due to the precarious placement of the vines. The extra effort put into these grapes is well worth it. They consistently produce wines with low alcohol content and exceptionally elegant flavors - perfect for regular enjoyment. 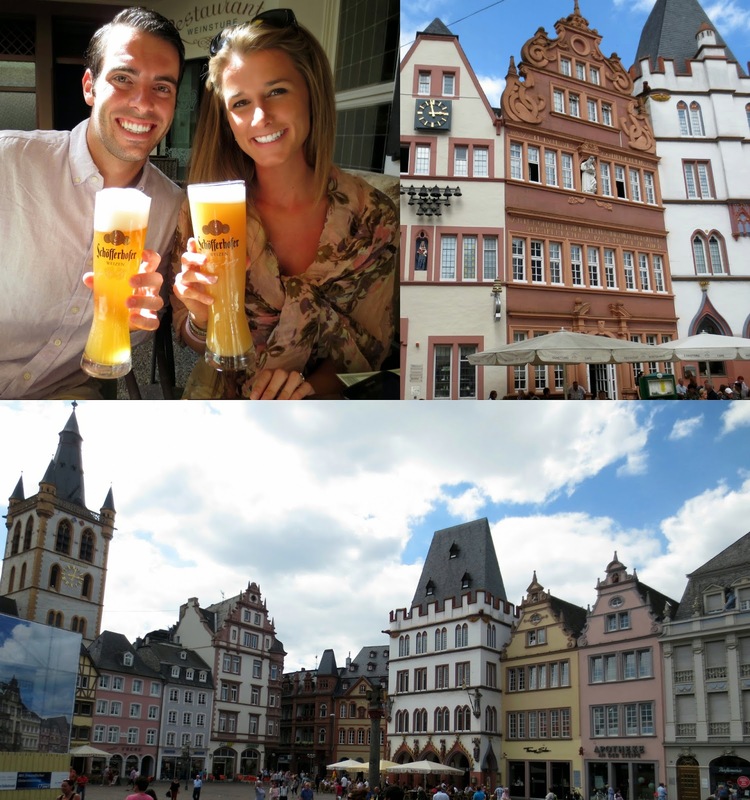 Our destination, Trier, is the perfect place to sip my first taste of Deutschland. 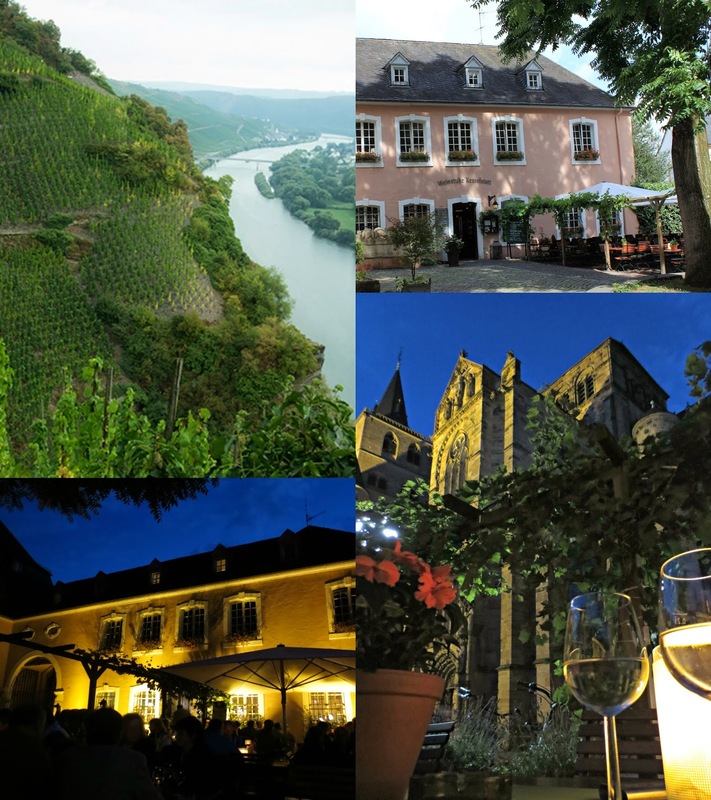 The Mosel Valley is the cradle of German wine culture and I, for one, am ready to dive right in! After dropping our bags by the apartment we’ve reserved here in Trier, we head straight to the town center where just around a quiet corner we find a bustling wine pub – the Weinstube Kesselstatt. This weinstube is nestled into what was once a manor of the palace that stood on this square – with exposed beams, cozy seating and eclectic décor it is a busy but inviting scene. It’s a self service pub and as we approach the counter I’ve apparently forgotten that weinstubes are outlets of individual wineries. I try to order a “House Riesling”. The attendant gestures to a full-wall chalkboard with white scribbles from ceiling to floor - They are all house Rieslings. Every wine on this extensive list is a product of the Reichsgraf von Kesselstatt estate! The excitement of so many incredible options trumps the brief feeling of stupidity that has washed over me. Wilhelm and I enjoy a bottle of the perfectly crisp, yet sweet, ‘Sommerpalais’, and then another. We order “Das Beste der Region” in hopes of getting a good, local snack - a wooden board full of fresh, regional cheeses, breads and hams finds its way to our table. We eat, we drink and we even make a few friends (or at least we think so - our German is sub-par, after all!). All of this whilst sitting on the terrace under the emerging stars, staring up at some of Trier’s most beautiful and mysterious attractions. Before us sit the Dom zu Trier (Saint Peter’s Cathedral) and the Liebfrauenkirche (The Church of Our Lady). Not only is Trier Dom the oldest church in Germany but it is also home a few significant Christian relics. According to legend, Saint Helena returned from a trip to Jerusalem, in the 4th century, with the robe Jesus wore at the crucifixion. She also brought back a nail that is believed by many to have been used in the crucifixion of Christ as well. Mention of the robe was discovered in historical documents in the 12th century at which point the cathedral altar was opened up in search of the holy relic. 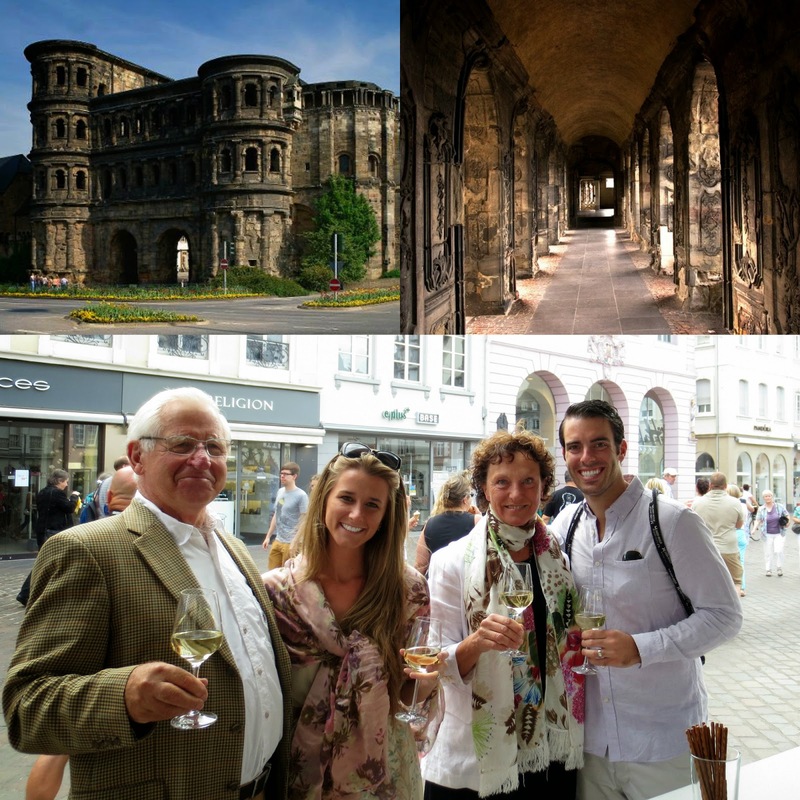 The robe was found, and remains, in Trier where Christians from all corners of the world still come to view it. ^ Regardless of your religious affiliation, this is certainly an interesting bit of history that Trier lays claim to! The Dom and its neighboring Liebfrauenkirche are on the itinerary for tomorrow. For now, we head back to rest up for a true-Trier-tour, given by none other than Tante Elisabeth – Wilhelm’s beloved aunt and godmother! Our travel plans for the next month revolve around our wonderful wedding gift from my in-laws: A Global train pass. This is a pass available to non-European citizens and is offered from 10 days to two months with unlimited train travel fully included. This afternoon is our first trial of the train system and as we stand wide-eyed, staring at the departure ticker in the center of the enormous Rome Termini Train Station, I can't help but wonder if we may have bitten off a tad more than we can chew! Fortunately, I soon discover my worry is unfounded as our trip to Venice has started off oh-so-smoothly! So far, train travel is significantly more convenient than travel via airplane. One can simply arrive at the station 10 minutes prior to departure, heave your luggage aboard your assigned train car, locate your seat number and settle in for the ride. (*I do advise making reservations as the trains fill up and though they'll still sell you a ticket, you may be standing the duration of even a 3 hour trip!) No need to check in at the counter, or even go through the ever-agonizing security check -a questionable practice in my Americanized opinion, but a delightfully convenient one! Our very last stop in Rome is to a location that's a bit grim - no warm and fuzzies like the story of the loving Roman Cat Ladies. This tale initially comes off a bit morbid, but don't judge this crypt by its decor too quickly! 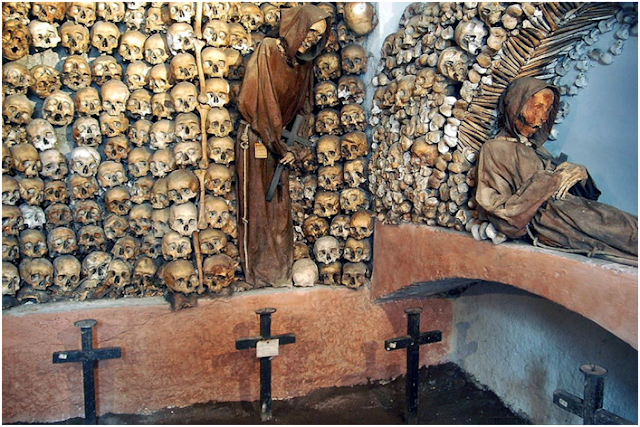 Though a lesser known attraction, the Capuchin Crypt is a highlight of Rome and an absolute must-see. At a minimum, I can promise this site is unlike anything you've ever seen before. Descending into the crypt, we find ourselves in the midst of an eerie art piece. The strangeness of this place is first frightening and then wildly fascinating. There is opulence in the decay, extravagance in the darkness. The chandeliers are artfully composed of human vertebrae, and the wallpaper of skulls. 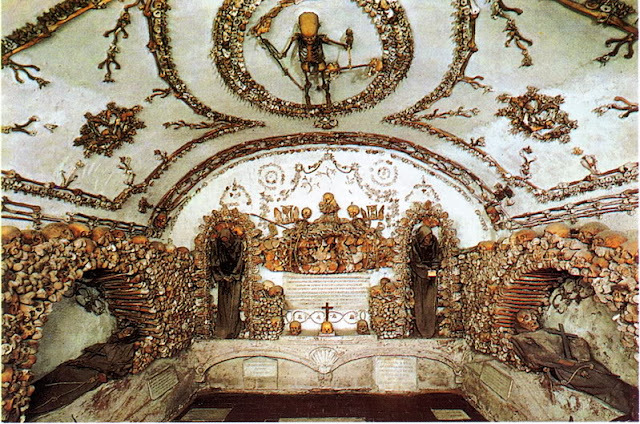 This crypt is the final resting place to the remains of 4,000 Capuchin Monks. The brothers of this order who died between 1528 and 1870 are all laid to rest as pieces of this riveting work. While it appears to be one of ghastly macabre - this sect of Catholic Monks claims it is anything but. This work is intended not to revere death, not to idolize the darkness but to embrace it in a manner which speaks to those still earthbound. This crypt has been created over hundreds of years to be a reminder of life's impermanence. Pelvises are arranged into flower-like sculptures, leg bones pinned to wall creating frames, and full skeletons clad in the hooded robes of the Capuchins find eternal slumber in small niches about the crypt. Everything in sight is shriveled and bizarre, but somehow the collection, and care with which it is arranged, makes an incredibly stunning and stirring work of art. It is rumored that an artist (and subsequent madman in the opinion of many), who took refuge in the basement of the church for some time, began this project and that the tradition was then continued by the Order as brothers died over the subsequent 200 years. 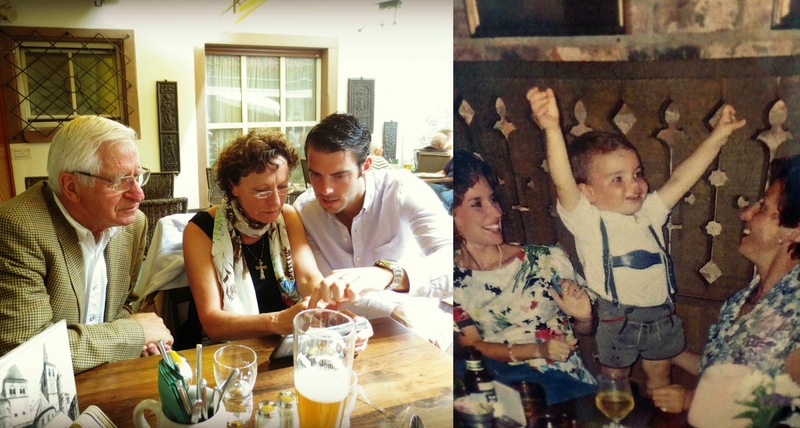 "What you are, we once were. What we are, you someday will be". 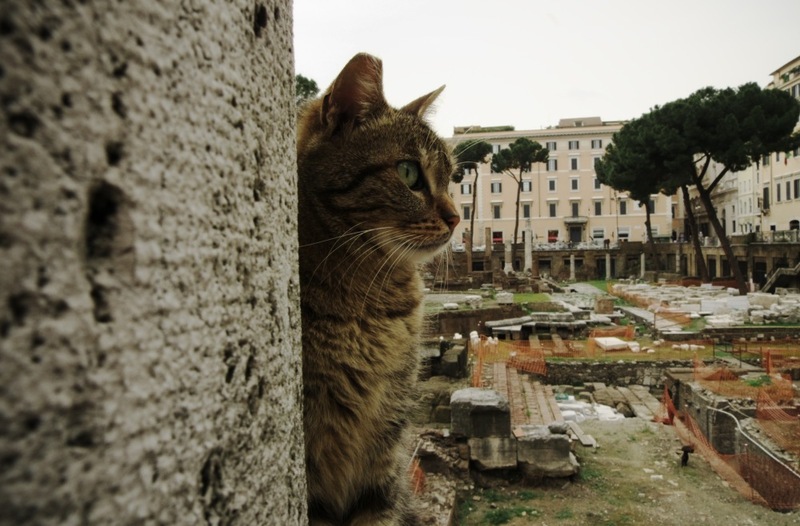 “Et tu, Brute?” The very spot at which (in the year 44 BC) Julius Caesar was stabbed to death by his rivals - today acts as a safe haven for the abandoned cats of Rome! This archaeological gem, known as Torre Argentina, is seemingly sunken below the happenings surrounding it as modern Rome is built about 25 feet above the ancient city. If one doesn't know what to look for, they might look down and see nothing more than another pile of old rocks dug up in the 1920’s and forgotten as the world grew up around them.